The Fiji soccer team will be gunning for a win in its final 2010 FIFA World Cup South Africa Qualifier against New Zealand next Wednesday to improve its FIFA World rankings ahead of the 2009 season. 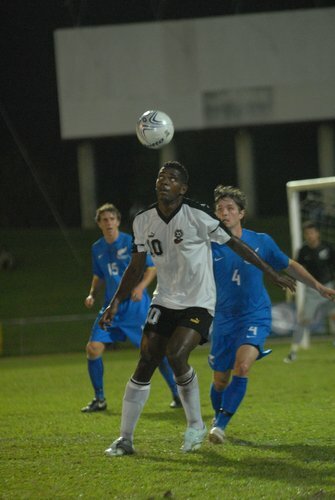 The latest ranking released yesterday has seen Fiji move up from 138 to 137 on the FIFA rankings. The Fijian football side is ranked third in the Oceania region behind the New Zealand All Whites (1st) and New Caledonia (2nd). Fiji soccer coach Juan Carlos Buzzetti had earlier stated that his brigade will go all out against the Kiwis and give it their best shot in order to improve their ranking on the world stage. A win in the encounter to the South Seas islanders would notably improve their ranking as New Zealand is ranked among the top 70 nations. The Kiwis despite leading the region have fallen 6 places and are currently at 60th position while the New Caledonians are on 121. If Fiji manages to beat New Zealand next week then their ranking is expected to rise up to ten places due to New Zealand’s superior ranking. Vanuatu has made the biggest leap this month by moving four places up to better its ranking to 143 while the Solomon Islands have fallen two places to stand fifth in Oceania with a ranking of 165. Meanwhile, Spain still maintains the number one spot while Germany has climbed to second place displacing Italy to third place. Netherlands is in fourth place, Brazil in fifth while England which was out of top ten for sometime is ranked at tenth place with Portugal. The next ranking will be released on December 17.